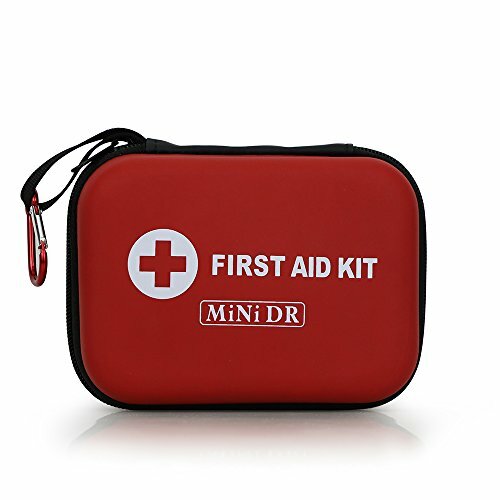 In this article, we’re going to take a look at some of the best mini first-aid kits which could fit into any of your bag’s pockets. Every day, life is fraught with risks and even at home, accidents do occur which no one can foresee or predict. It doesn’t even matter whether there are children or adults, it is essential that every wound is treated speedily and with care. This is why every home must have well-stocked first aid kit is a wise investment. It is estimated that every 2.5 seconds, another accident occurs in the home. But only those who are equipped with adhesive bandages, antiseptic wipes, etc. have the advantage or an upper hand. But they are not only meant for homes; every office must also be equipped with emergency medical kits since everyday accidents such as choking, slips, poisoning, etc. can also occur in the workplace. 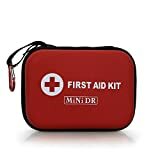 Now, most people usually go for low quality pre-made first aid kits, but most of them do not have everything that a first aid kit should have. Of course, pre-made kits usually come with essential wound care products, but it is crucial to add extra products to them. It is, therefore, prudent that you should stock the kit with relevant medical products. For instance, if a family has someone with asthma, it should have an inhaler kept aside for emergencies. Some of these kits are designed for particular activities such as camping, hiking, boating, etc. 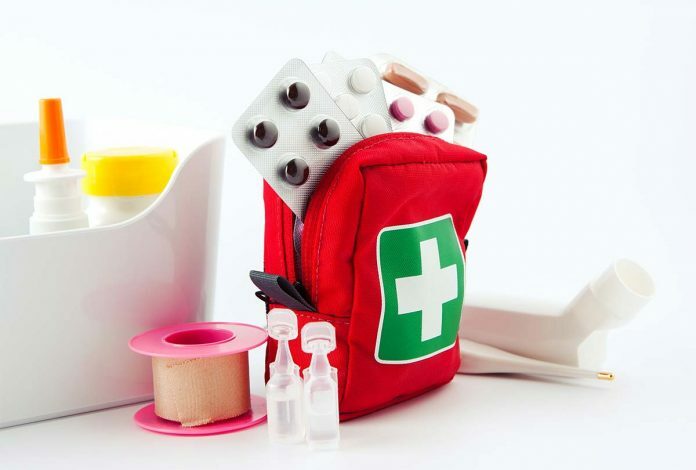 Being the first individual to administer first aid can be a daunting experience for you, but with a well-stocked first aid kit in addition to a little knowledge or know-how, you can make a lot of difference in emergency situations that call for medical attention. You need to ensure that the kit is kept somewhere that is dry and every member of your family must know where it is at all times. You should always check it from time to time, and any supplies that are getting depleted or running out of date should be replaced with fresh ones. It is also essential to be conversant with the supplies in the kit and how to use them when the need arises. This is why you need to obtain a copy of the manual along with the kit. You can also download the manual online. A pain reliever like aspirin, etc. 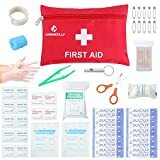 This is one of the best travel-size medical kits which contain some of the most commonly used materials such as antibiotic ointment, antiseptic wipes or Latex-free bandages. It comes packaged in brushed, crush-resistant metal tinplate and has a hinged top. Despite its small size, this kit has more than enough space for holding the most commonly used items for treatment. 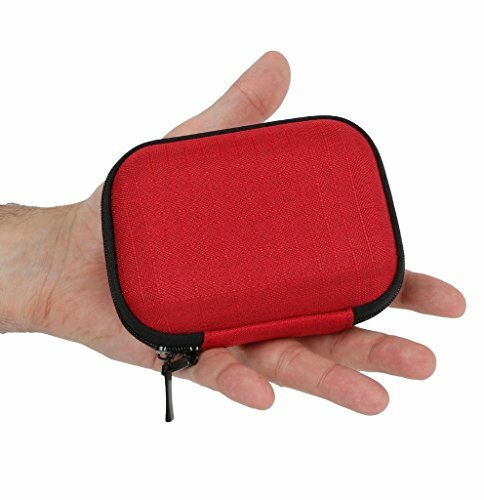 It is very compact and will fit into any satchel, backpack, etc. without taking up to much space. If you are a boater, camper, biker, or hiker, having it will make you rest easy knowing that whatever emergency situation that calls for immediate medical attention will be covered swiftly. It comes with an embossed cross so that you can easily and quickly identify it in the dark. This kit comes with a premium quality nylon bag that is lightweight, durable and practical enough to fit into your glove compartment. This rescue zipper bag is waterproof, thanks to the inner laminate bags which protect every item inside from excess moisture. Its the type that can be employed during disasters such as earthquakes as well as other real-world emergencies. 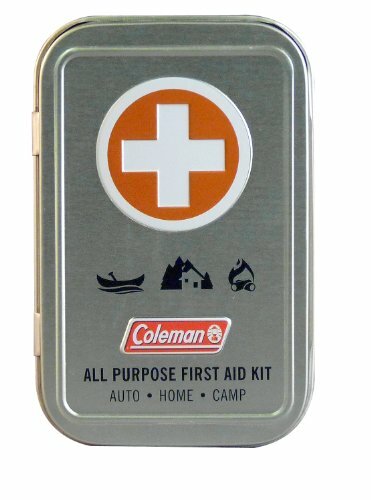 This kit is excellent for use during emergencies at home, office, restaurants, during camping, boating trips, etc. If you are looking for the best value as well as the most comprehensive bag on the market today, then get your hands on it. It comes with thirty-five unique medical items, compact and very portable. 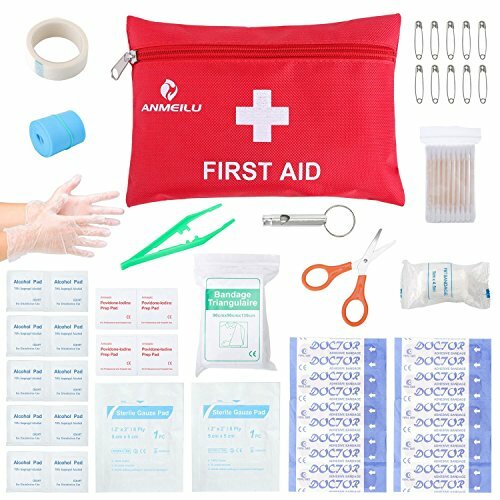 Its uniqueness stems from the fact that a well-packaged kit should contain all the necessary things that would be very useful during times of emergency. Despite this, it measures not more than 7.9x6x3.1 which makes it compact enough to fit anywhere. But if it happens not to have space in your backpack, this product comes with a free carabiner which you can utilize by clipping it to your belt or on the outside of your bag. 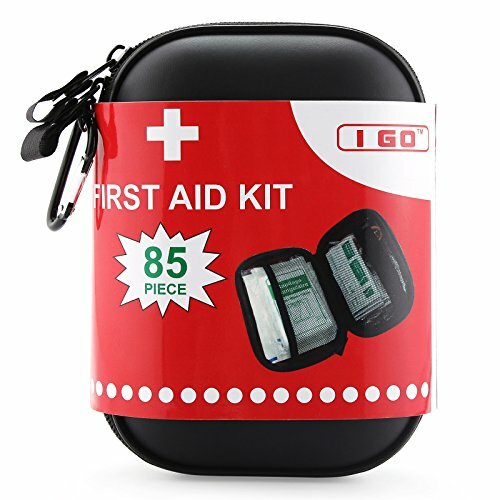 It is designed with clear pockets positioned on the inside of the semi-hard case which allows you to see the contents of the medical pack at a glance. This is very useful since it will enable you to see the expiration dates on each of the items in the kit. However, you need not worry since all the contents of this kit come with excellent shelf lives. You can even use up the remaining space in the box too by adding some necessities voluntarily. Its affordability and versatility make it viable, and health experts recommend that you keep one at home, in your car as well as in your office. It is also the best kit to have when you go hiking, camping or bicycling during holidays. It gives profound peace of mind and gives you the assurance that you have all the right tools as well as the emergency supplies that you will ever need to deal with any medical emergency. 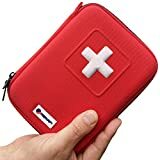 With its large, white cross to prevent it from getting lost – even comes with a small booklet that teaches about First Aid and the manufactures offer a risk-free one hundred percent guarantee. Its affordability makes it possible for you to have a set in your home, your car, and in your office. Despite the fact that no one expects it, emergencies do take place and having an emergency kit that is well-equipped nearby is very crucial. Being prepared to handle emergencies anywhere it happens – whether at home, at work or outdoors– could be the difference between life and death. This is why the product was created and particularly custom-made to tackle a variety of injuries and features a complete selection of vital medical supplies that are often needed when emergencies arise. It comes in a high-quality and durable case and will not be smashed or squished when included with other things. The medical kit is compact – 7.8″x6″x5.9″ – so it is a perfect fit in your vehicle, bike, motorcycle, or yacht. It is also refillable, which means that any medical supplies that are used up can be replaced immediately with fresh ones. It was manufactured in a modern Food and Drug Administration (FDA) registered facility which implies that it is approved by the U.S. agency that oversees the safety of drugs and food. This kit is trusted by many and is handy for people living in areas prone to natural disasters such as earthquakes, flooding, hurricanes, etc. It holds more than one hundred and forty pieces of medical items. Life is unpredictable, and there is no way you can foresee accidents. But in a world that changes very fast, being prepared for any contingency is prudent, and this is why MiNi Case was created. It is portable and compact – measures only 6¼ “x 4¾ “x 2¾ “– and lightweight, meaning that it can fit anywhere. It also comes with a carabiner that you can utilize by clipping it to the outside of your backpack in case there is no longer any space inside. It is manufactured using high-quality materials that are approved by the FDA and is widely used by doctors, nurses, and hospitals. The interior compartment is fully organized so that you can quickly access its content. The durable case is sturdy and made of high-density semi-water-resistant material. Thrive Box is equipped with sixty valuable and beneficial medical items all of which are encased in durable rip-stop nylon EVA Foam soft shell case. It is compact, yet able to hold every medical item one would need in case of an emergency. The kit measures 5″x3.75″x1.5,” i.e. 5 inches long x 3.75 inches wide x 1.5 inches thick and weighs nothing more than about 0.3lbs. Its perfect for daily use, and every home, office, vehicle, restaurant, etc. should have one. It is also the ideal kit you will ever need in combat field survival trauma situations. Manufactured in a sterile FDA facility and complying with the OSHA and American ANSI standards, this kit is a must-have for anyone who also loves adventures. This one comes with 85 hospital grade medical supplies, yet weigh just 0.56lbs and packaged in a durable, compact, and flexible design. It is manufactured under strict FDA observation to ensure that it surpasses the safety standards for emergency first aid. Its one of the best medical supplies to have at hand during natural disasters like flooding, hurricane, earthquake, etc. If you like camping, hunting, hiking, backpacking, boating, etc. then you need I Go Compact First Aid Kit. You should always remember to restock your kit from time to time. There is nothing more distressing or worse than needing something important only to find out at the last moment that someone has taken or removed it without replacing the item. One of the first things that disappear quickly is bandages because most children love to play with them. Well, this was our guide on first-aid kits. They’re small, versatile and so-much-needed when life starts messing up with you. I’m pretty much convinced that the article raised a few questions in your mind, so let us know your thoughts in the comments section below!